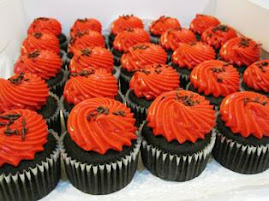 Red valvet cup cakes - Haida. Blueberry Philadelphia Brownies - Niza Haniz. Oreo Cheese CupCakes - Datin June. Red Valvet Cup Cakes - Datin June. Apam dot2 - Cikgu Anisah. Blueberry Philadelphia brownies - Maznolita. De'mini Cheese Tart - Rachell. Blueberry Philadelphia Brownies - Liz. Carrot Walnut Cupcakes - Datin June. Rose Cup Cakes - Datin June. Oreo mini cheese tart - Datin June. RV Cakes & RV Cupcakes - Izume. Red Valvet Cup Cakes - Maurena. Brownies For open House - Mila. Carrot cake untuk open house. Order dari Niza dan Fiza. Carrot Walnut Cake - Rachell. Choc Cheese Brownies with edible image. Hari Raya Cookies ordered in 2011. Oreo Cheese Cake - Datin June. Ultraman cake - Kak fipah. Moist Choc Cake - Cik Yuzz. De'Mini Cheese Tart - Noor Hasnidah. Choc Philadelphia Brownies - Shikin. Choc Cheese Cake - Shikin. Moist Choc Cake - Shikin. Blueberry Cheese Cake - Farah. Carrot Walnut Cake - Farah. Red Velvet Cup cakes - Nora. Choc Phil Brownies - Nora. Carrot Cake for reunion - Nora. Choc Philadelphia Brownies - Nora. Mickey Mouse Club House Brownies - Siti. Mr. Niza order Brownies nie untuk staffnya di Saujana Golf Kuala Lumpur, makanya dia minta I potong siap2 brownies, sebiji brownies dipotong 18pcs. He ordered 2 biji brownies. Sms received from Mr.Niza " Salam. My staff really enjoyed the brownies. Tahnka." Thank you so much Mr. Niza for the order. Mr. Niza via fb comment "Linda, my colleagues kat Saujana Golf really enjoyed this. Some comments:' balanced between texture and weight", "pleasantly sweet", "have not eaten something like this for a long time", 'can i take home some?' Thanks for making it a brighter days for a lot of people that day." Order dari Shariman Norly, a 1 recipe choc cake simple design with 5 cartoon figurine. Ada angah, Wie, Arina, Aimy dan Zariff. Thank you dear for your order. The sms i recived from Datin June - "sedap rv tu. Just nice tak kering n tak moist sgt. Thanks Linda". Thank you so much Datin for the order. Pn. 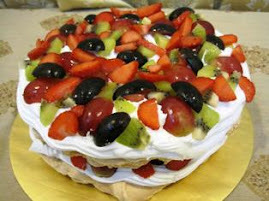 Rafidah order kek nie khas untuk anak bujang nya yang sangat sukan kan gajah. mula2 she request kek shape gajah, 2D sahaja. So I pun google2 lah...jumpa lak si Dumbo nie (ada rupa dumbo ke), suggest kat dia, terus berkenan. Specially for her son's birthday. And than, she call me back request nak rainbow cake inside. But I said i x pernah buat rainboe cake, i x de recipe nya, but alternatively i boleh buat vanilla letak colour2....heheheh. Hope she and her son love the cake. Thank you for the order. "Linnn....saya nak bright colour eh......nak merahhh.....hijauuuuu"....hahha...nie lah hasil nya. Masa datang collect apam nie, anak2 cikgu anisah sempat rasa yg xtra..."apam aunty nie lagi sedap lah ibu"....terima kasih Cikgu Anisah for the order. Cikgu Anisah via fb comment "sedapppppp"
Terima kasih Fiesya, sudi order cheese tart dari La Muffine. Fiesya beli box extra untuk letak tarts nie nak buat hantaran katanya, nasib baik ada kotak lebih...heheheh....thank you dear for the purchase. Thank you to Maznolita yg order brownies, asalnya dia nak order tuk raya, tapi mungkin x sempat nak ke rumah i collect dia tukar tarikh to 15 sbb her birthday. Thank you for the order ya. Thank you Rachell for the order. Thank you Meelaa pesot d'kota for the order....heheheh...nanti boleh order lagi ye.....Melaa via fb "sedap...TQ...ada blueberry lg dlm..."
"Linda I nak pastel colour ya linda...." 25pcs vanilla cupcakes with buttercream rose flower. Datin order sempena majlis pertunangan anaknya. Tahniah diatas pertunangan anak datin. Thank you so much for the order. Datin suka flavour oreo, sbb kurang manis kalau nak compare dgn yg lain. She ordered 2 boxes. Thank you so much datin. Izume order assorted mini muffine to give away. "Letak dalam kotak kecik2 eh, kang takut ramai lak org". Thank Ninie for the order. Last minute order by Izume, a red valvet cake and cupcakes. Sebiji untuk her friend di juhor dan the cupcakes for her makan2, balas dendam sbb raya hari tu dia x dapat makan. Thank you dear for the order. Assorted mini muffine ordered by Kryptonite Redefine, 3 flavour, choc chip, double choc dan the new flavour rocky road muffine. semoga muffine nie menyerikan lagi majlis you ya. thank you dear. Order dari Maurena, dia nak cuba my RV cupcakes. sebelum nie dia sanggup ke KLCC semata2 nak beli RV cupcakes. Katanya kalau mine is ok sedap, x payah lah lagi dia ke KLCC tuk beli cupcakes. Alhamdullilah...lepas mkn RV tu she wrote at my wall - "thanks akk tuk red velvet yg sgt2 sedap.. terbaik!!!! nti mrn order lg ya.. x puas la akk, hehehehehe ;)". Thank you so much dear. Sempat ambik gambar 2 keping je tuk order nie semalam...heheeh....sorry ye Mila. Terima kasih sbb order dgn La Muffine. Hope semua org kat office tu suka ye brownies nie. Thank you so much dear.